Just when I think I can’t possibly come up with another way to slice and dice macaroni and cheese (and please, take a look at my related posts at the bottom of this post to see what I mean! ), I somehow manage to come up with another way. My brother recently asked me if I had to pick a last meal what it would be, and after much thought I have picked…macaroni and cheese. (Side note: We get along just fine, andI am almost certain this was general curiosity and I have nothing to be worried about. ;-) ) Which maybe explains all my varieties of it, and this one has two great things going for it. Lots of colorful veggies, and the whole thing cooks all together in one pot all at the same time. If that isn’t mac and cheese heaven, I don’t know what is…let’s make it! So here’s what you do: you need a nice deep heavy skillet. Put all the ingredients in it – yes, all of them. Uncooked elbow macaroni, the veggies, milk, cheese, water and a little flour. Bring it to a simmer, cover it and let it cook for about 10 minutes, then uncover and let it go another 5 minutes. At that point the pasta will be cooked, the veggies will be tender, the cheese will be melty, and you will be seconds away from eating creamy, dreamy macaroni and cheese with some pretty tomatoes and broccoli swirled right into it. Now my only issue is figuring out if that last meal will be this version of mac and cheese or one of the others. Decisions, decisions…I better try them all out again just to be sure! 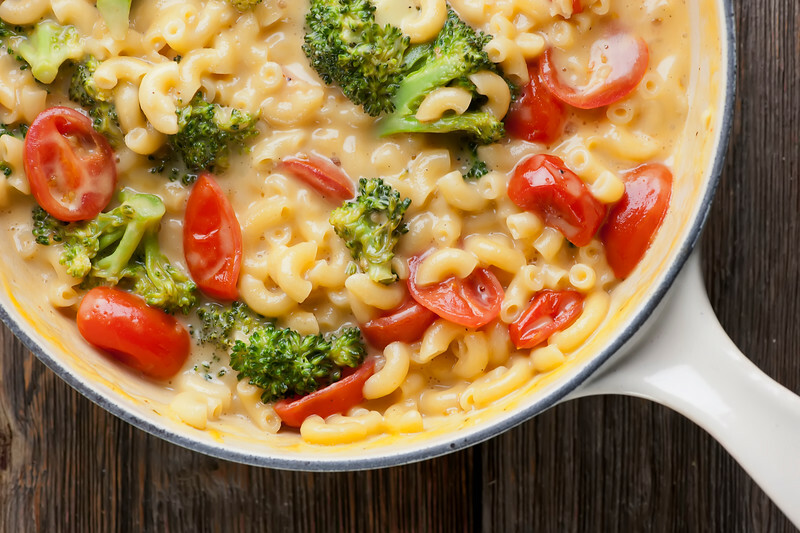 Pasta, cheese and veggies all cook up together in one pot in this easy and delicious recipe for vegetable macaroni and cheese! Combine all ingredients except salt and pepper in a large deep skillet. Bring to a simmer and cover. Simmer for 10 minutes. Uncover and simmer for another 5 minutes or until pasta is tender. Taste and season as needed with salt and pepper. That’s it! Ladle it out and serve. Thanks for this recipe! I made this for lunch today. Needed comfort food on a rainy day! Substituted the broccoli for cauliflower! Delicious! And really easy! Hurray! I love the cauliflower addition – I’m definitely doing that next time! Turned out pretty good. I didn’t pay attention to the heat on my stove and almost burnt it at first……turned the heat down and added more milk for cooking. My hubby and 9 yr old loved it. I used canned diced tomatoes with their juices, white cheddar, a dash of powdered mustard and a bit more milk than called for. Then, I baked it with Italian seasoned breadcrumbs and a drizzle of olive oil. So good!